Keeping your Edge Relay up to date can prevent headaches and have your Edge Relay running optimally. There are two ways to update the edge firmware, manually uploading a file or via the web UI. Download thesysupgrade-compatible image file to your local machine. 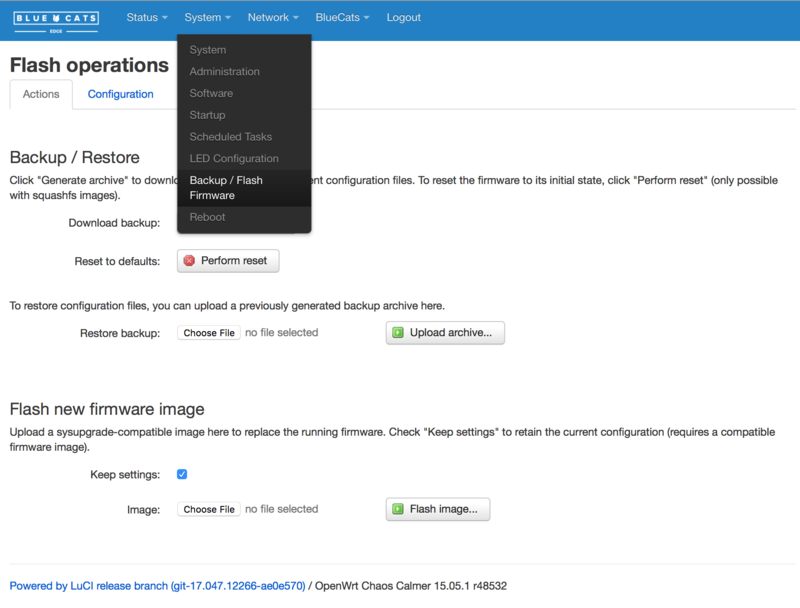 Navigate to System -> Backup / Flash Firmware and then choose image file by clicking the choose file button in the Flash new firmware image section. Uncheck the Keep settings checkbox when flashing a major firmware revision. You can keep it checked for minor firmware updates. Click Flash Image button to proceed. Compare the checksum and the file size with the original file to ensure data integrity. Click Proceed to start the flash process. Wait a few minutes before you try to reconnect. Depending on your settings, it might be necessary to renew the address of your computer to reach the device again. This requires the edge to be internet connected which you can do by configuring the WIFI as described in the getting started doc. Then navigate to Bluecats -> Connect and Manage. If the Device Register Status is Registered then the edge device is successfully connected with the Bluecats cloud services. If the status is 'Invalid' or you need to re-register the device, refer registering the device. 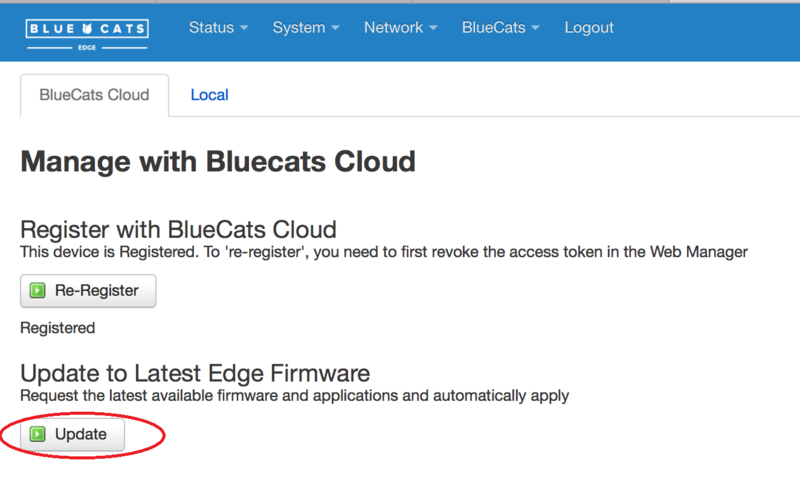 Once registered in BlueCats cloud, click the Update button on the Update to Latest Edge Firmware section to update the Edge to the latest firmware. Wait a few minutes before you try to reconnect. This update will not overwrite your settings.